Corticosteroids, alone or in combination with other drugs, have been shown to inhibit angiogenesis. The purpose of this study was to evaluate the efficacy of triamcinolone acetonide in a new model of preretinal neovascularization. Rabbit eyes were treated with intravitreal triamcinolone acetonide 24 h before partial liquefaction of the posterior vitreous with hyaluronidase and injection of 250000 homologous tissue-cultured dermal fibroblasts. 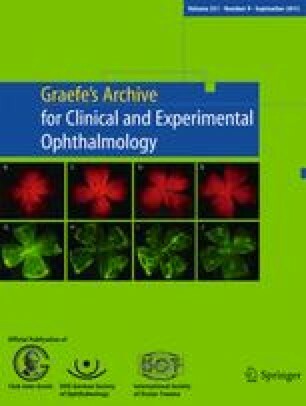 Triamcinolone acetonide effectively inhibited new vessel growth in treated eyes. Only 14% of the treated eyes developed new blood vessels compared to 100% of sham-injected control eyes (P<0.001). These results suggest that intravitreal triamcinolone acetonide might be effective in inhibiting new vessel growth in patients with inflammatory retinal neovascularization, such as that associated with sarcoidosis or other uveitic syndromes. This work was supported in part by a National Research Service Award (A.N.A., EY 06057-01), a NIH research grant (R 01 EY02903, D.L.H. ), a NEI core grant IP30 EY 05722, Veterans Administration Medical Research Funds (D.L.H. ), and a generous gift from Dr. and Mrs. Harris Vernick. Dr. Hatchell is a Senior Scientific Investigator for Research to Prevent Blindness Inc. The views expressed in this article are those of the authors and do not reflect the official policy or position of the Department of the Air Force, the Department of Defense nor the United States government.